(Newser) – Marco Rubio's presidential campaign is widely seen to be in its dying days—but the Florida senator says he's not interested in signing up with any others. During an MSNBC town hall on Wednesday, Rubio said he's "not looking to be anyone's vice president" and that he would "absolutely" say no to Donald Trump, who had said earlier in the day that he would definitely consider Rubio, if he dropped out this week. Rubio also shot down the idea of teaming up with Ted Cruz to defeat Trump, describing it as "House of Cards stuff." "Those kinds of things rarely work," he told the town hall. "I can just tell you I'm a candidate for president." Little Marco is waaaaay down the list of possible VPs. Bernie Sanders is probably higher on that list. 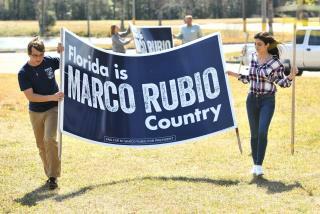 "Florida is Marco Rubio country"? That is NOT something to brag about :-) Anyway, Trump is about to F up all the good things he currently has going for him any day now. He'll either ask Sarah Palin to be his VP, and people will start to walk. Or he'll say something WAY over the top at a rally, and people will start to walk. I have no doubt that Trump won't ask him.